The European project COME IN – Competences in Enterprises on Integration – intends to support efficient integration of refugees and migrants in labour market by enhancing the competences of employers and their key staff. Therefore we are looking for success stories or approaches to be honoured within the frame of a contest. Does your organisation employ a refugee or a person with migration background? Do you promote diversity and inclusive working climate? Welcoming enterprises from the European Union are invited to take part in the COME IN project, share their success stories and enrol for the COME IN Award. It’s a competition that aims to promote integration of refugees and migrants in European businesses. We are looking for innovative initiatives or ideas to promote workforce integration of refugees and migrants. The competition is targeted to all companies, NGOs and public authorities that support refugees’ and/or migrants’ employment. Owners or staff members of those organisations can apply for the award. The organisations must be registered in one of the following countries: 28 Member States of the European Union, Iceland, Liechtenstein, Norway, Switzerland, Turkey. You can enter the contest with implemented, existing and planned approaches/ projects. Read all information on the website and the FAQs. Fill in the form (you can get a preview of the submission sheet here). If applicable, upload files of your project. Which projects/ approaches can be submitted? When can you start submitting your project/ approach? You can upload your project/ approach from April 5th 2019 onwards. Please submit your project/ approach by, August 9th 2019. The winners will be invited to present their project at the conference which will be held on September 24th, 2019, in Mechelen, Belgium with an international audience. The prize includes travel, accommodation and subsistence for a 2-day trip to Mechelen. The winners will get the opportunity to present their cases during the final conference and will benefit from a European wide dissemination in a specific newsletter and on our COME IN website. 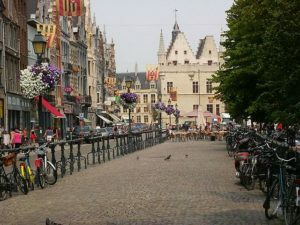 Mechelen is located right between (and close to) Antwerp and Brussels. The city has a long history, but has much more to offer than just tradition. The Financial Times called Mechelen one of the 10 European cities of the future. You can find inspiring reasons to visit Mechelen here. We are looking forward to your approaches and wish you the best of luck!